Think You’re Drafting a Running Back in the First Round of your Fantasy Draft This Year? Think Again! If there is one thing just about everybody agrees on when it comes to fantasy football, it’s that you need to spend your first pick on a running back. It’s even common for your first two picks to be running backs. And there is good reason. Last year I did some data analysis and confirmed that you should still be drafting a running back with your first pick. But that was 365 days ago! There has been an entire season’s worth of data since then. Just like in the quality improvement world, the landscape of sports is constantly changing. You'd better keep your information up to date, or you’ll end up in your fantasy league’s basement! So what happened in the NFL last year? Well, we know it was a great year for quarterbacks. Not one, but two different quarterbacks broke the NFL record for most passing yards in a season. On top of that, 3 different quarterbacks threw for over 5,000 yards and a fourth (Eli Manning) threw for 4,933. Before last year, only two quarterbacks in the history of the NFL had ever thrown for 5,000 yards. So how does this relate to fantasy football? I took the top 25 scoring quarterbacks from 2011, and compared their total number of fantasy points to the players from the previous 5 seasons with the same rank. For example, Aaron Rodgers led all quarterbacks with 431 fantasy points last year. The quarterbacks that led the league in fantasy points the previous 5 years (Vick, Rodgers, Brees, Brady, and Manning) scored an average of 347.8 points. So Rodgers scored 83.2 more points than the average #1 ranked quarterback. NOTE: All data comes from KFFL.com and does not include any games in week 17 or the NFL playoffs. You can get the data here. The difference is green if it is positive and red if it is negative. Yes, that’s right. Every single quarterback scored more points in 2011 than the average quarterback at their rank the previous 5 years. But before you start screaming “ZOMG, I’m drafting 8 quarterbacks this year!” ask yourself a question: Was last season simply a statistical outlier, or was it part of a trend? Sounds like we need to look at a time series plot. You’re looking at a time series plot of the average fantasy score for the top 25 quarterbacks each of the last 6 years. Does anybody see a trend? Not only does it appear that last season wasn’t an outlier, but I wouldn’t be surprised if 2012 was an even better year for quarterbacks. We already know that quarterbacks score a lot. In the past if you didn’t get Rodgers, Brady, or Brees, you could draft somebody else that wasn’t too far behind. As for running backs, if you didn’t grab an elite one early, you were in serious trouble because there just aren’t that many great running backs. But take a second look at the table above. Sure, everybody improved, but who improved the most? The top quarterbacks. While everybody may be getting better, it’s the elite quarterbacks who are benefiting the most. All of a sudden if you miss on Rodgers, Brady, or Brees, you’re sacrificing a lot more points than you used to. And I can show it. In part II of my fantasy football draft process analysis last year, I looked at the standard deviation of different positions. The greater the standard deviation is, the more the data are spread out. The position with the greatest spread is the one you want to draft early on. So what if I use data from last year? Let’s compare the standard deviation of the top 10 quarterbacks to the top 20 running backs (I use 20 running backs because you draft more of them). Things have changed! You’re now losing out on more points if you draft an elite running back instead of an elite quarterback. For example, let’s say last year you had the #1 pick in the draft and you knew Aaron Rodgers would be the #1 QB and LeSean McCoy would be the #1 running back. Whichever position you don’t draft, you have to take an average player (the #10 ranked player for QBs, #20 for RBs). How many points would you be giving up by passing on either one? By drafting the RB first, you’re losing out on 30 more points. And this assumes you knew McCoy would be the #1 running back. Had you drafted Adrian Peterson (the preseason #1 RB), you would have lost out on 121 fantasy points! And just to drive the point home, here is an individual value plot of the top 25 quarterbacks and running backs from last year. You can easily see that after the first 5 quarterbacks, you’ve already lost out on 129 points. Meanwhile it takes 19 running backs to be drafted until you lose 129 points. So yes, this is all based on a single year of data. There is definitely a chance the top quarterbacks come back to earth this season. However, we already saw that their scores have been trending up the past six years. I would argue that the potential rewards outweigh the risks. So Who Should I Draft? 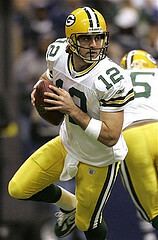 Aaron Rodgers should be your #1 pick, without a doubt. He’s ranked in the top 3 in fantasy scoring each of the last four years. And last year, even if you knew who the best running back would be, Rodgers was still the better decision. If he is off the board, you can’t go wrong with Tom Brady or Drew Brees. If you could tell me who the #1 running back will be at the end of the season, I would tell you to pick them. But you don’t know who that will be. Remember what happened to Chris Johnson last year? Running backs are a lot more inconsistent year to year than quarterbacks. With the rate that quarterbacks are scoring at now, I would actually take Brady and Brees #2 and #3. And seeing as how most people will still draft a running back first, you should be able to get either quarterback even if you don't have a top pick. If those 3 guys are all off the board, don’t hesitate to pull the trigger on Matthew Stafford or Cam Newton. Now, I wouldn’t draft them ahead of any of the top running backs, but they are fine selections in the late first round or second round. If you miss out on any of those five, your best bet is to wait awhile to draft your quarterback. But with 5 legitimate options (maybe six with Peyton Manning), you should be able to grab a top quarterback with your first or second pick. 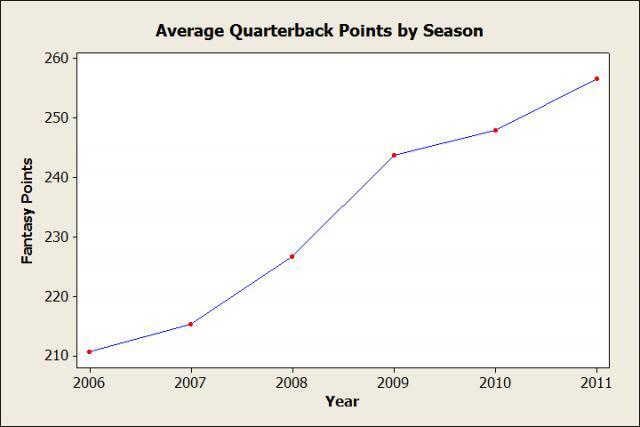 And if the quarterback trend keeps going up just like it has been the last six years, you’ll be glad you did! Photograph by avinashkunnath. Licensed under Creative Commons Attribution 2.0.